Alex Carapetis (born May 1982) is an Australian-born studio and touring drummer who toured with Nine Inch Nails for the 2005 Fall Arena Tour leg of the Live: With Teeth tour. Carapetis grew up in Adelaide, Australia. It was there that he began playing the drums at age 11, becoming trained in jazz drumming. He has played for several pop artists and has done some touring, though most of his work is in the studio. Following the abrupt departure of Jerome Dillon on October 1, 2005, Nine Inch Nails initially offered the drummer position to Josh Freese, who was only available for two dates on the main part of the tour. Auditions were held during Freese's two-day stay with the band, and Carapetis was one of the last people to audition. Trent Reznor was confident in Carapetis' abilities and felt that he would be a good fit with the band. An unorthodox rehearsal schedule was laid out for Carapetis to learn the setlist without any more dates having to be cancelled. This included rehearsing before and during soundchecks, and after shows. Reznor already had postponed three concerts in less than two weeks and was reluctant to postpone or cancel any more. Carapetis was offered the drummer position for the remainder of the entire North American tour, which would have included the Winter 2006 Arena Tour and the Summer Amphitheatre Tour. Although he was flattered, he graciously declined the offer. He had no interest in going on an extensive US tour, and also knew that Freese wanted the drummer position in NIN much more than he himself did. 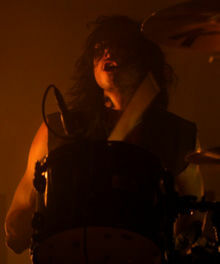 Once NIN returned to California after the South American leg of the tour, Carapetis stepped down and Freese stepped in, becoming NIN's official drummer at the 2005 KROQ Almost Acoustic Christmas concert in Los Angeles. Carapetis has stated that he was not fired from the band and that he and Reznor are still on good terms. Currently, Carapetis resides in Los Angeles, where he works as a studio drummer and plays in his own band, Crash Hot. This page was last modified on 10 July 2007, at 09:28. This page has been accessed 27,966 times.